A Beatles song adapted into a comic. This my For No One comic, adaptating of For No One, by The Beatles. It’s one of the longest comics I’ve made to date. And one of my most elaborate comicsperiments as well. It tries to blend music and comics in a way that goes beyond simply adapting ‘song content’ into a sequential narrative. • Click on the image above, or here to read the PDF version of the comic. • Click here to go to a jpg version. • Right click and save as, to download the PDF. To explain how this For No One comic adaptats the Beatles song exactly, I created a special breakdown page. • How the For No One Comic relates to the Beatles song. • How I used the Revolver album cover as an inspiration. • How I transcribed For No One into a comic book grid. • How I connected the color wheel to the circle of fifths. • How I used Visual Replication to depict Rhyme. • How I used different text-types to add a second layer to the story. Click here to go to the breakdown page. Click on the image above, or here to watch the video of our For No One Acoustic Cover. I’ve said this before and I’ll say it again, I think it shouldn’t be necessary to read my comic book breakdowns or explanations to enjoy the comic. 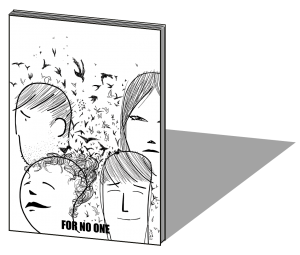 So I’m curious to hear your thoughts on my For No One Comic. And if you did read the breakdown (link) do let me know what you thought of that in relation to the story.